March 16, 2012 July 12, 2016 / Julie Brook, Esq. 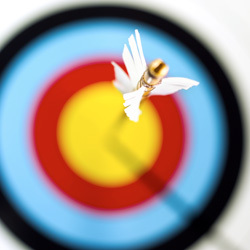 Here are 10 arrows in your quiver of objections to shoot at any discovery request. The key is to aim only with an objection that is factually justified and to hit the request on the bullseye. 1. IRRELEVANT: Object that information sought is not relevant to subject matter of the action, and is neither (1) admissible nor (3) reasonably calculated to lead to discovery of admissible evidence. CCP §2017.010. 2. OVER NUMERICAL: Object when more than 35 specially prepared interrogatories or requests for admissions are propounded without a declaration for additional discovery (CCP §§2030.030(a)(1), 2030.240(b), 2033.030(a), 2033.230(b)), or there is a declaration for additional discovery but you believe that additional discovery is not justified. CCP §§2030.040(b), 2030.090, 2033.040(b), 2033.080. 3. CONCERNING PLAINTIFF’S SEXUAL CONDUCT: Object when discovery calls for information about plaintiff’s sexual conduct with persons other than alleged perpetrator in action for sexual harassment, sexual assault, or sexual battery, unless defendant first obtains court order. CCP §2017.220. 4. OVERLY BURDENSOME OR OPPRESSIVE: Object to discovery when the likelihood that discovery will lead to admissible evidence is outweighed by burden, expense, or intrusiveness (CCP §2017.020(a)), the discovery is unreasonably cumulative or duplicative (CCP §2019.030(a)(1)), the discovery is obtainable from another, less burdensome source (CCP §2019.030(a)(1)), or the party is using discovery in a way that causes unwarranted annoyance, embarrassment, or oppression, or undue burden and expense. CCP §2023.010(c). 5. PRIVILEGED: Object when discovery calls for information falling under an evidentiary privilege, such as self-incrimination (Evid C §940), attorney-client privilege (Evid C §§950-952), or marital privilege (Evid C §§970-980). 6. CALLS FOR TAX RETURNS: Object when discovery calls for either state or federal tax returns. Rev & T C §§19282, 26451. 7. WITHIN WORK PRODUCT PROTECTION: Object when discovery calls for information protected by work product, e.g., any writing that reflects attorney’s impressions, conclusions, opinions, or legal research or theories (CCP §2018.030(a)). 8. CONCERNING DEFENDANT’S FINANCIAL INFORMATION: Object when the plaintiff seeks to discover the financial condition of the defendant or the profits that the defendant has gained by conduct allegedly making the defendant liable for punitive damages, unless the plaintiff first obtains court order permitting such discovery. 9. PROTECTED BY RIGHT OF PRIVACY: Object under both U.S. Constitution and Cal Const art I, §1, if discovery calls for information protected by right to privacy, e.g., financial information about employees and stockholders, personnel files, personal financial information. 10. OFFICIAL PROCEEDINGS: Object when discovery calls for publications or broadcasts made in legislative, judicial, or other official proceeding. CC §47. Use your objections wisely, keeping in mind that you will be wearing the objection target soon enough. Details on all of these objections are in CEB’s California Civil Discovery Practice and California Trial Objections. Also check out CEB’s Action Guide Obtaining Discovery: Initiating and Responding to Discovery Procedures.